Happy Friday everyone! Sadly I’ll be working the weekend but I hope that you all will have nice, relaxing Saturdays and Sundays. So last weekend Sephora had their V.I.B. 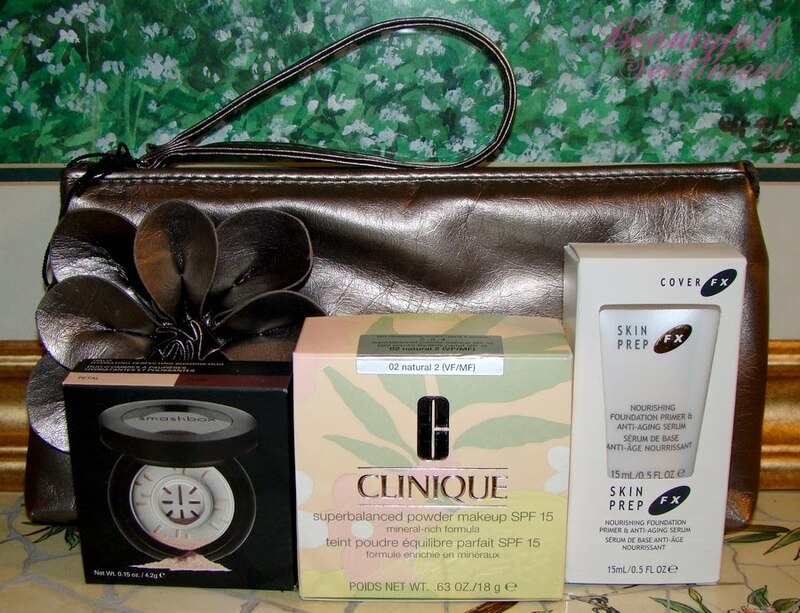 20% off shopping event, and I figured it was about time to pick up a few more items to review on the blog. I picked up Smashbox’s new Halo eyeshadow duo, Clinique’s Superbalanced Powder Makeup (requested by a reader and I do aim to please here at ABS), and Cover FX’s SkinPrep primer (it was only $8 and of course they stacked them by the register to tempt me – I couldn’t resist). Plus I got this great clutch full of samples in addition to my 20% off. Check out the contents of my clutch after the jump! Yesterday, November 12, 2009 marked the kick-off of Sephora’s V.I.B. Exclusive Holiday Shopping Event, but for those of you who missed out, no need to fret, it’s going on all weekend! Print out your e-mails November 13-15 to receive 20% off all purchases all weekend long, and for all of you online shopped enter code: V324HW at checkout to get your 20% savings. What will you be purchasing with your holiday savings? I may pick up this Clinique powder that a reader requested a review of and maybe some foundation refill pods for my TEMPTU as those things go quickly! 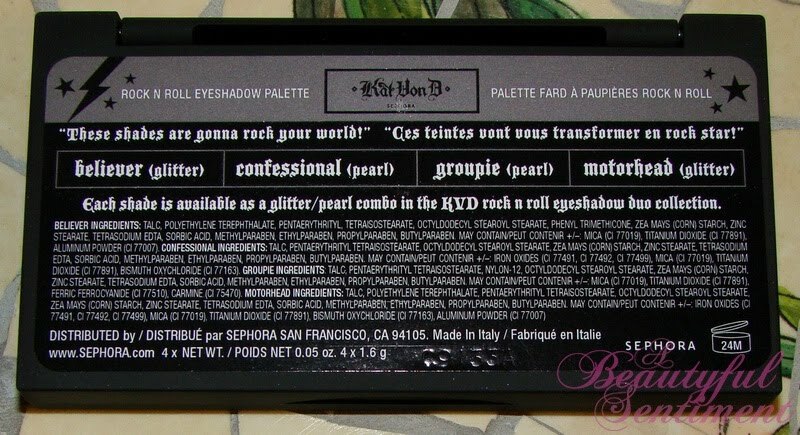 I was all gaga over this Kat von D Rock n Roll Eyeshadow Palette Sephora was offering as one of its 500 point gifts, and of course I had to get it even though I’d been hoarding my points for who knows how long. So I’ll bet you’re all wondering, was it worth the splurge? Is it really worth 500 of your precious points that you’ve so painstakingly accumulated? 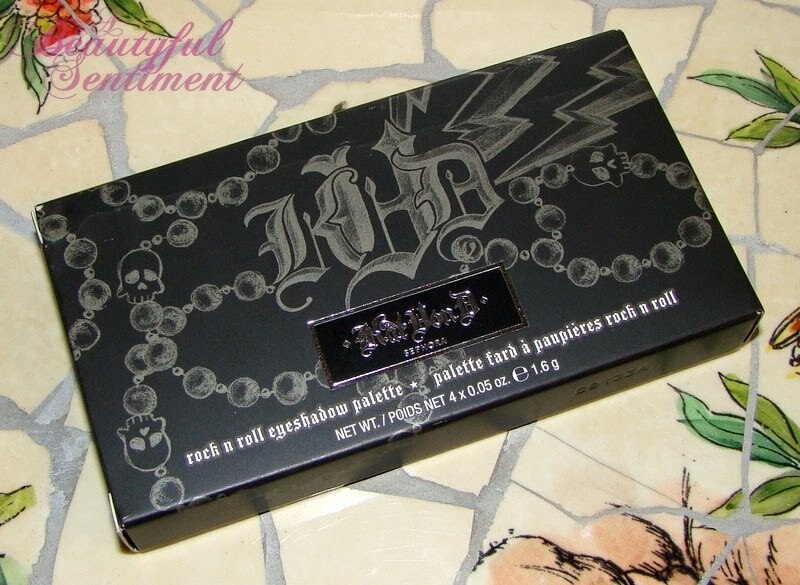 Wondering if the Kat von D Rock n Roll Palette actually rocked my world? Find out (and check out the close-ups and swatches) after the jump! I bet you look at this palette and think fabulous hip packaging, some great wearable shades that aren’t too crazy but not too boring either, plus a cute mini brush ~ what could be better, right? Well honestly, pretty much anything. I gave this palette chance after chance to at least make me fall in like with it, but it just wasn’t to be. 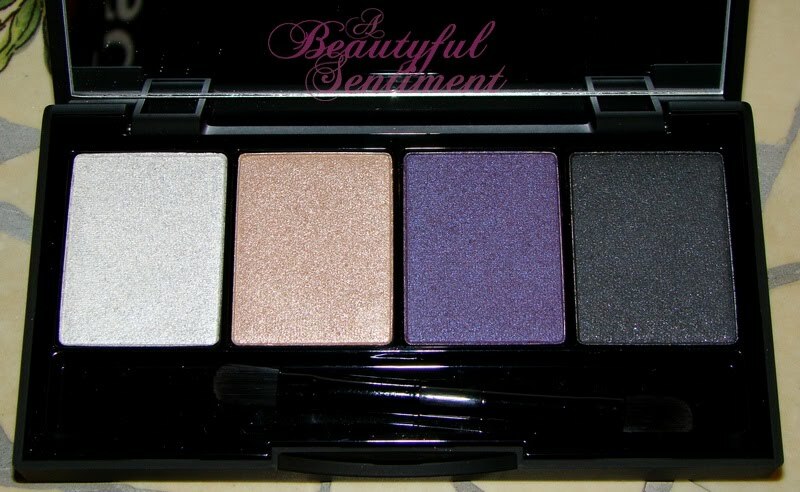 The swatches above are of Believer, Confessional, Groupie and Motorhead, and all four shades were seriously unpigmented. I had to swipe at the shadow 3-4 times to get the amount of color I did above! Thanks to the lack of pigmentation, I found that these shadows lent my overall eye looks a muddy, dull appearance and really weren’t very flattering at all. 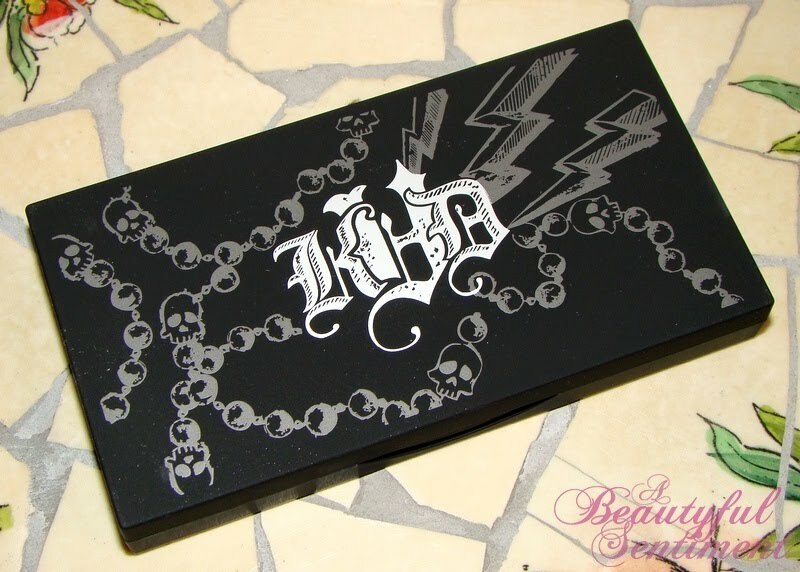 Now I’m not judging the rest of Kat von D’s products based upon this palette as I’ve heard that her regular palettes really are quite special, but I’m a little saddened that my introduction into the world of Kat von D was so lackluster. The Verdict: Save your points for something better! I do really LOVE the packaging but the contents are less than stellar and really not worth spending those 500 points on. – 0.12 oz Cargo LashActivator. 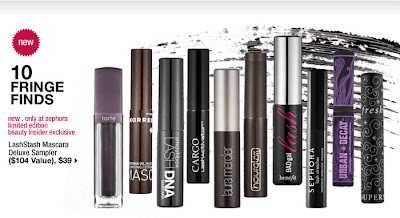 My Thoughts: Sephora’s sampler kits have always been good in the past, but this new slew of releases is downright awesome! I love that they’ve included some high-end items such as the Givenchy gloss and Guerlain Meteorites, and each set contains multiple items that I already love (such as the Bliss Fabulous Foaming Face Wash which is good stuff) and even more that I’d love to try (such as Cargo’s LashActivator). As always I happen to think these are a tad overpriced, but if they’re within your budget I think they’d make somebody an amazing stocking stuffer or holiday gift! There’s a New 500 Point Sephora Gift in Town! 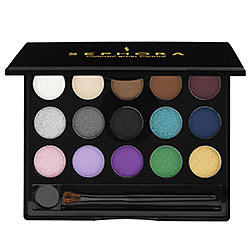 After a long dry spell during which the only Sephora 500 point gift available was the rather blah Sephora palette that I had no desire to redeem my hard-earned points for, Sephora finally has something interesting up! I’ll definitely be trading in 500 of the points in my Beauty Bank for this limited-edition, full-size palette created by Kat Von D exclusively for Sephora’s Beauty Insiders. 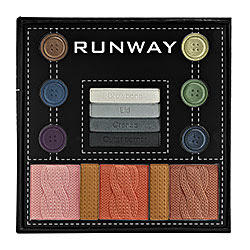 Will you be trading in your points for this fun palette, or do you plan to save them until something better comes along? Are You a Sephora V.I.B.? Apparently Sephora launched it’s new Very Important Beauty Insiders program by sending out a slew of these “You’re Officially a V.I.B.” e-mails. I was a little too excited to see the 10% off coupon code — I think somebody needs to step away from sephora.com for a bit! Hypnôse Drama creates full-bodied, high-volume lashes in a single stroke. The oversized, full-contact Convex Brush has an S-shaped curve that grasps and loads lashes for a fanned out, full-bodied fringe. It even dramatizes corner lashes that other brushes miss. Lancôme’s new luxurious, texturizing complex features highly saturated waxes and intense black pigments that provide maximum lash coating and rich color. The triple-coating system with Pro-Vitamin B5 delivers a fluid and creamy application, with long playtime, to quickly and easily build big, battable lashes. You all know I’m a sucker for cool/new/different mascara wands! I was thinking I’d been ordering Givenchy’s new & improved Phenomen’eyes release, but then Sephora decides to torment me by sending this little morsel of delight to my inbox! Should I? Shouldn’t I? It does say ‘quantities are limited’! Which of the two would you rather see reviewed for the Mascara Series? 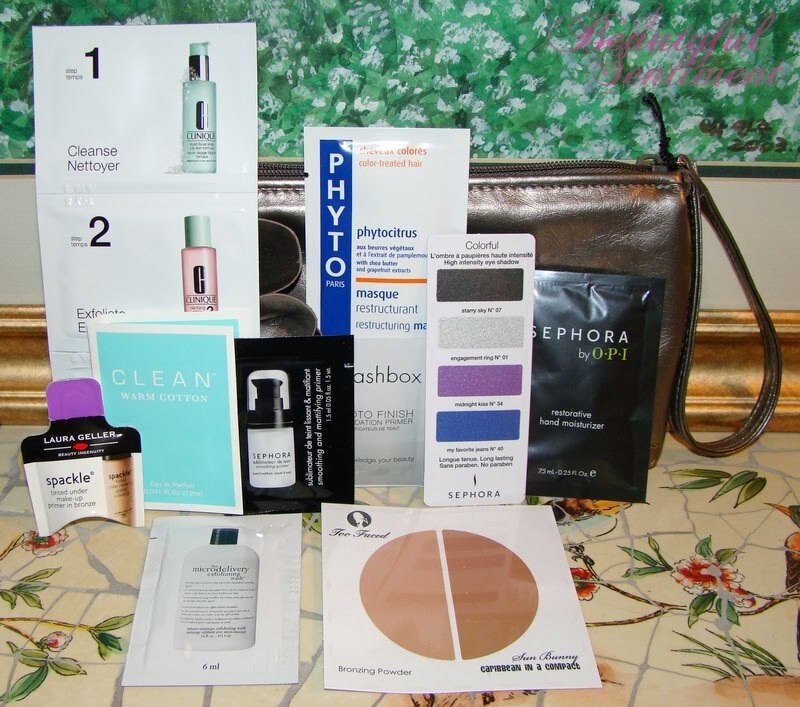 Take Your Pick: Two Sephora Deals, Plus a Beauty Insiders Dior Exclusive! For all your Sephora junkies, right now there are two great codes to choose from. Receive 10% off your entire purchase by entering code: YG85P at checkout, OR enter code: XOXO at checkout to receive a free Baby Sugar Fresh Lipgloss with any purchase. I’m thinking I’ll go for the gloss, although I’m a little annoyed since I just received a bunch of stuff from Sephora =X. Sephora’s also been updating their site with a bunch of great new items including some super cute Harajuku Lovers makeup bags and this (for now) Beauty Insiders exclusive Dior Addict Lip Polish. To create ultrasmooth, ultrashiny lips backstage at fashion shows, pro makeup artists roll a cotton swab along models’ lips to gently exfoliate; then they apply petroleum jelly to prime the surface and multiply the shine of the gloss topcoat. Now, inspired by these backstage secrets, Dior introduces new Dior Addict Lip Polish. Enriched with moisturizing hyaluronic microspheres and ultrareflective mother-of-pearl pigments, the incredibly supple formula instantly recreates the impeccable, glowing look of the runway. The revolutionary and exclusive spin-on applicator, which picks up just the right amount of product and then rolls it uniformly onto the lips, provides a delicate massage that enhances the benefits of the formula. The Lip Polishes run $29.50 each (ouch I know!) and are available in three juicy shades that look to be on the sheer end of the spectrum. Now through April 21, 2009, get 15% off everything online and in stores @ Sephora by entering code: BD2T9CB5 at checkout! I’ll be taking full advantage of this code to finally use my Sephora gift card! I’ve been considering the new Fresh foundation that’s part of their Umbrain Clay line–it looks promising. I’m pretty sure this code is one time use per account, so shop accordingly!